Tricia Nitti has a passion for produce and a passion for empowering the young people in the community. As the Market Manager at the River Church Farmer’s Market, she helped bring the Power of Produce (POP) Club to the market. 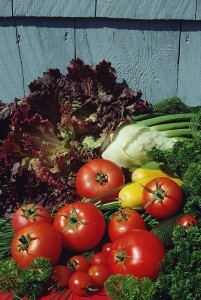 The club exists to help promote healthy eating and the power of buying local. The POP Club may have started off as a local market club for the kids visiting the River Church Farmer’s Market, but it has grown and evolved to encompass so much more. Children from seven elementary schools attend regularly. POP Club volunteers and others involved include master gardeners, vendors, artists, and the farm bureau. Weekly activities are provided at the open market for the children that attend. Children have had the opportunity to make fruit and herb infused water. For some, this was an eye opening and refreshing experience to help show them alternatives to sugary-carbonated beverages. Children have had other opportunities with the exposure to new foods, the importance of composting, and the life of a honey bee. POP Club members have the opportunity to earn a free kids meal from the Century House Tavern. This allows them incentive to participate in the program, and a way to truly experience how one local business supports the use of locally grown food. Additionally, children are able to spend market bucks within the market themselves. This allows them to choose what types of purchasing decisions they make. Some of the programming has been so successful at the market, that it is now being offered as an outreach or a reach-in program for local schools. Many local schools have an existing garden club. With programs about what a farm market is, or how to compost, POP is brought to life. The POP Club is a great way to integrate the Common Core Georgia State Standards and the Next Generation Science Standards. Not all students learn the same, so for the hands-on learner, the POP Club is an invaluable resource. The POP Club would love to expand with the help of strategic partners. If you are interested in helping support the POP Club, participating in the POP Club, or scheduling programming for a school or group, contact the Market Manager through the River Church Farmer’s Market Facebook page.